Joseph Goodman and his minions – plus special guest James M. Ward – preview and discuss the exciting new releases coming from Goodman Games in 2015, including Lankhmar DCC, new adventures, the DCC RPG Judges screen, Road Crew 2015 info, a new Metamorphosis Alpha kickstarter, and lots of other old school gaming goodness! Thanks for recording this gang. It means a lot for those of us who couldn’t make the trek. Looks like it will be another great year for Goodman Games. Joe Goodman really does have his work cut out herding all those squirrels! 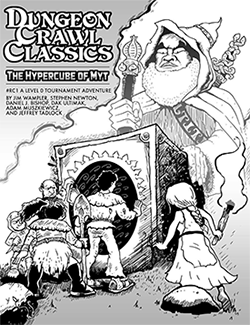 A DCCRPG version of X-Crawl!!! Hell yeah! I’m SOLD!!! I’m stoked for this year’s Goodman Games lineup! Thanks so much for putting the video together, Spellburn! What a feast Goodman Games is planning for us. I’m stoked for your Jack Vance-themed adventure, Jobe, my interest is far from nuncupatory! Wait a second, I watched this again… still no word on the DCC Annual? Must I beg for a new episode? Is that what you really want?